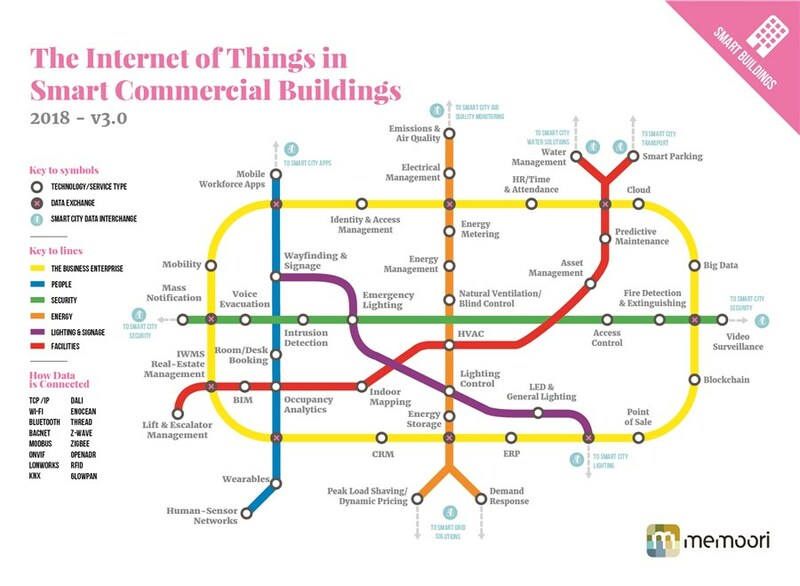 This Report is a new 2018 Study which Makes an Objective Assessment of the Market for Internet of Things Technologies, Networks and Services in Buildings 2018 to 2022. 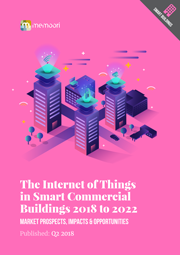 Our 3rd edition of research into the Market for the Internet of Things in Smart Buildings (BIoT) focuses on market sizing and opportunities for Smart Commercial Buildings. It provides a completely fresh market assessment of the market based upon the latest information. Regions for this edition of the study are spilt into 5 categories representing the international markets of North America, Latin America, Europe, Asia Pacific and The Middle East & Africa. Discover our market projections for the Internet of Things in Smart Commercial Buildings including network hardware and data services. We size the markets for 6 key areas – Enablement Hardware, Connectivity Services, Data Integration, Big Data Analysis, Application Software and Professional Value Add Services. Understand our most recent assessment of the underlying traditional BAS markets for Building Energy Control Systems, BECS Supervisory Software, Enterprise Energy Management Software, Fire Detection and Safety Systems, Lighting Controls and Physical Security Systems. Analyze the current situation in buildings contrasted with the vision for a future BIoT; And discover how business models and market opportunities will shift as BIoT moves from vision to reality. Discover our assessment of the number of connected devices that will be in operation by building vertical in 2022. Also the number of connected devices that will be deployed by business / technology application. 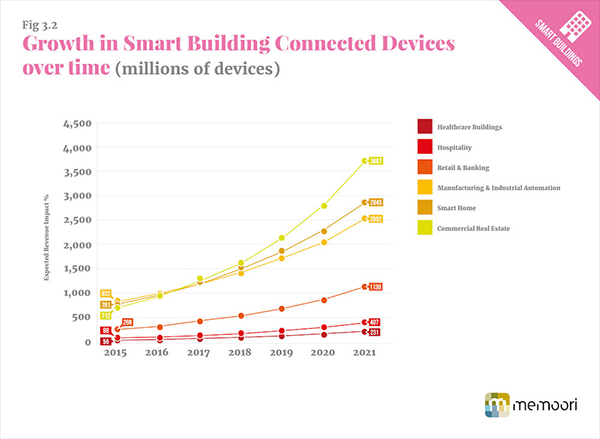 The IoT has had transformative effect on smart building automation and control in recent years, disrupting long established business models and offering significant new opportunities to improve the efficiency of buildings, raise employee productivity, as well as helping to stimulate the development of innovative new services. The report contains original analysis & forecasts, detailed analysis of the technology enablers, drivers and barriers shaping the market; a comprehensive assessment of the competitive landscape and crucial insights into what is driving M&A and investments into the market. Our research indicates that the underlying Traditional BAS market saw revenues for global building systems totaling $101Bn in 2016. Revenue from Building Energy and Control Systems (BECS) made up the largest proportion of the market, with sales of $33.4Bn, followed by physical security with sales of $28.8Bn, and Fire Detection & Safety with $23.2Bn. The overall market grew a further 6.5% through to the end of 2017, with the strongest growth being experienced in the lighting control area at 11%. We project that the combined global market for the Internet of Things in Buildings (BIoT) will continue to grow significantly over the forecast period, rising from $34.8Bn at the end of 2017 to $84.2Bn by 2022, representing a CAGR of 19.4%. Growth in this area has slowed slightly since our last assessment of the 2015-2021 period, published in 2016, largely due to the growing maturity of the market, but in part also due to other factors including persistent concerns over data privacy and cyber security as well as lower overall smart device proliferation estimates. The Asia-Pacific region overtook North America in terms of BIOT market revenues in 2015 and will retain its position as largest global market through to 2022. It currently represents just over a third of global sales (34.3%) and faster overall growth in the region will help it expand this share to over 36% by 2022. North America follows in terms of market size, but will decline in overall global importance from 30.9% in 2017 to 27.7% by 2022. Memoori monitored a total of 886 deals of different types between 2012 and April 2017. 77% of these deals (682) were venture capital investments, but we also observed nearly 200 acquisitions, 4 mergers, 5 IPOs and 1 patent acquisition over the period. All of which combine to indicate a continued ongoing demand for both new innovation and expansion via M&A in the BIoT space. Starting at only USD 1,750 (Single User License) this report provides valuable information so companies can improve their strategic planning exercises AND look at the potential for developing their business through merger, acquisition and alliance. The information contained in this report will be of value to all those engaged in managing, operating and investing in Commercial Smart Buildings (and their Advisers) around the world. In particular those wishing to understand exactly how the Internet of Thing is impacting Commercial Real Estate will find it particularly useful. Fig 9.1 – Who are the Emerging Leaders in the IoT market?